Tambourine Man is leaving Spokane! Michael "Tambourine Man" Ransford is leaving Spokane and the local music scene may never be the same again. From late-night dive bar shows to huge community festivals, the Spokane music scene will soon be missing one of its biggest characters. Michael Ransford, commonly referred to as Tambourine Man as he’s often wielding the clanging instrument, is leaving Spokane. He’s not going too far away, just far enough to make it tough to shake his buns at local shows nearly every night of the week. Ransford is moving back to Moses Lake, his hometown. He’s moving back to rest his aching body and clear his mind. Pushing 60, he wants to be comfortable as he ages, he says. He should be all moved by the end of the week. Since this year’s Volume, Ransford’s already notable 6-foot-3 frame was made more noticeable with a new bleached blonde hair look. This summer, he attended all the important shows around town, large and small — his strutting rooster-like moves and incredibly tight clothing on full display. Wherever he goes, excited whispers of “there’s Tambourine Man” follow. He is a curiosity as well as a scene mascot of sorts. He knows this. Ransford says he should still be around for some of the bigger Spokane events in the future, but for now, he’s taking a much-needed breather. In the meantime, does Ransford believe someone else should take up his tambourine torch? “Whoever wants to do it, they can do whatever they want,” Ransford says. “I never cornered the market on what I do and I never will and if someone wants to go out there and match what I’ve done… like I’ve said, you need skills and talent." 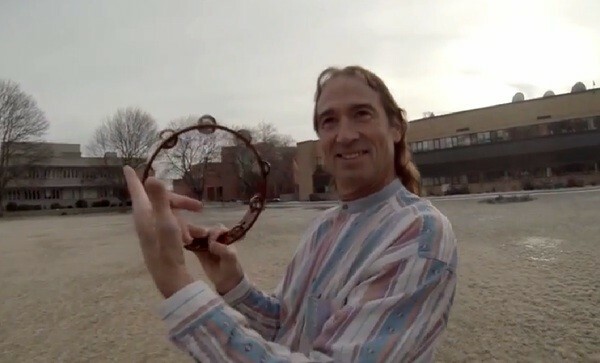 Just for a little nostalgia, check out this 2014 “Hey Mr. Spokane Tambourine Man!” song made by a Gonzaga University student filmmaker.